As I sit here watching my sweet baby girl sleep, a part of me is still grieving over all the obstacles we’ve had to face these past few weeks. After nearly a year of researching and preparing for a natural childbirth, we watched as just about everything we worked so hard for unraveled. Since then, I’ve been trying to overcome feelings of failure and gain the confidence to talk about my experience. I have my mother-in-law to thank for encouraging me to write this blog post….she said you’d be amazed at how many other women share the same feelings and need to know that they did everything in their power to do the best they could. I have learned that there really are some things completely out of our control, no matter how hard we try. Never in my life have I ever felt so extremely lucky and unlucky all at the same time. Josh and I read dozens of books, watched videos, took a 10-week natural childbirth class, and hired an amazing doula…..but nothing could prepare us for what we actually went through. People were constantly telling me it’s a waste of time to create a plan and that I was crazy for thinking I could give birth naturally. I remained focused and determined – ignoring all the negative remarks. It was important to me to do this without the use of drugs because in the past, medications had done a number to my system. For almost three years I hadn’t even taken as much as an aspirin….well, that was up until about three weeks ago. We decline the IV or heplock. We wish to keep vaginal exams to a minimum. We wish for intermittent fetal monitoring. We wish for dim lights, quiet voices, music and the use of essential oils. We wish to use the tub, birthing ball, and squat bar. We wish to be mobile and able to walk around during labor. During the labor, Mandy wishes to eat and drink as she desires. We DO NOT wish to use any form of pain medication, but will inquire if needed. As long as mother & baby are healthy we DO NOT wish to have a cesarean. If a cesarean is medically necessary, Josh is to remain present at all times. We DO NOT wish for an episiotomy, please use warm cloths and massage to decrease the chance of tearing. We wish for immediate skin to skin contact between Mandy and Willow. We wish for delayed cord clamping/cutting. Josh will cut the umbilical cord. We DO NOT wish for Willow to be given eye drops, vitamin K or Hep B shot. Please DO NOT bathe Willow. We wish for the vernix to be massaged into her skin. Willow is to be exclusively breastfed. We DO NOT wish to use Pitocin in order to deliver the placenta. I began the early stages of labor on Friday, April 13th…but I didn’t know it at the time. Sounds crazy, right?! I had no clue that the intense cramping I was feeling were actually contractions. It wasn’t until the next day that I figured it out. We labored at home – took a walk, relaxed in the tub, and tried to just go about our normal routine (as much as we could). Our doula came over close to midnight when the pain was getting worse and we headed for the hospital close to 3am where I labored for another 16 hours. I labored for nearly two days, almost all of it drug-free, but it got to a point where I wasn’t progressing and was exhausted. The last four hours is when our plan fell apart. It started with the doctor breaking my water, then they tried to induce with Pitocin. I should probably mention that for most of Sunday, my contractions were 50 seconds apart…not fun. I thought I knew pain, but absolutely nothing compares to childbirth! I kept crying and telling Josh and our doula that I couldn’t do it anymore – the pain was unbearable and I just so badly wanted to sleep (it had been well over a day since I had slept). So I ended up with an epidural and the relief came almost instantly. The contractions continued at their rapid pace, but I was not progressing. The doctor even mimicked a contraction and noticed that the baby was not budging. He told us that the she never dropped and that I wasn’t dilating – my pelvis was too small for her. At this point, her heart rate spiked to 170 and at about 7:15pm I was being wheeled away for a c-section. In all of our research and preparing, I skipped over every section that talked about cesarean….go figure. I couldn’t believe that after two days of hard work and months of preparing, I was having a c-section. I felt robbed, cheated out of the experience I wanted. Josh stayed right by my side during the surgery and I remember asking him, “Is it still the 15th?” You see, if she wasn’t going to arrive on her estimated due date (April 8th), we wanted the 15th because I was born on Feb 15 and Josh was born on June 15…she was destined to be a 15th baby! I just had no concept of time or what day it was – it literally felt like I was in labor for weeks. Then I heard her cry for the first time and my heart just melted and the tears started flowing. 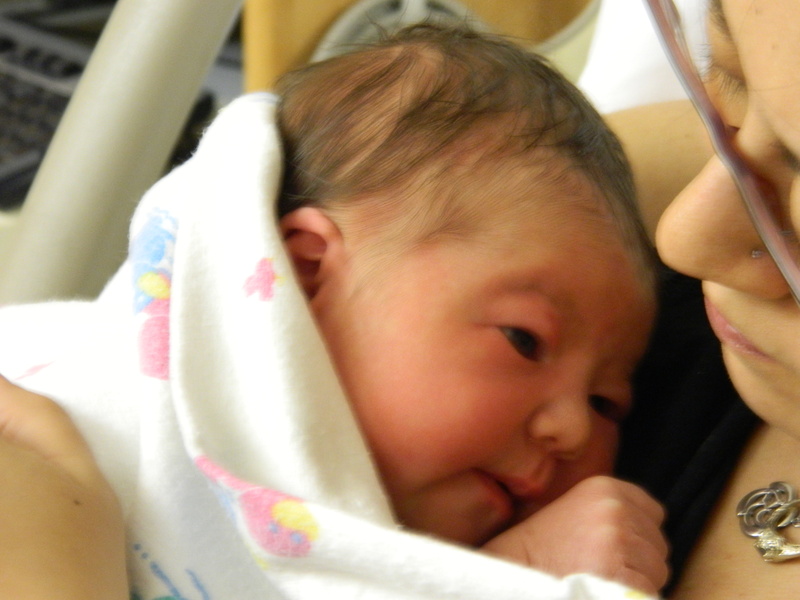 Willow Rayne Bradley arrived at 7:52pm on April 15, 2012. She was 8lb 3oz and 21in long. I couldn’t believe she was finally here – I felt like the luckiest girl in the world. Speaking of luck, our bad luck just wouldn’t go away…. It’s to be expected that you spend (on average) 3 days in the hospital if you have a c-section, but we didn’t get the leave until day 5. It’s normal for babies to lose 5-7% of their birth weight…Willow lost 12%…a full pound. The doctors and nurses urged us to start supplementing with formula, which for me, was another stab in the heart. Out of everything, breastfeeding was the one thing I thought I could count on – it was so important to me. Willow’s health meant much more than our moral and personal beliefs, so we started the formula. For anyone out there who has done the SNS system, you know what a pain it is. For those that don’t know: you put the baby to breast, sneak a tiny tube attached to a syringe into their mouth, and feed them as they’re sucking. Josh and I continued this method for well over a week…the lactation nurse said for our sanity, introduce a bottle. The SNS system required the both of us at each feeding – which meant two extremely sleep deprived parents trying to stay patient with the tube falling out and formula leaking everywhere. I even tried the prescription Domperidone, but nothing. My determination and hope is still with me, but the discouragement is exhausting. I reached out to our local Le Leche League and she felt my pain. She told me that I should be proud at how hard I tried and to really take the time to mourn as this is a very sad turn of events. Sometimes there is no explanation. Sometimes a mother just cannot produce milk. Out of everything that I read, nothing ever prepared me for this. The cesarean coupled with all the drugs pumped through my system definitely delayed milk production, but this long?! There are absolutely no words to describe the pain and sadness I feel. It breaks my heart to know that I cannot provide her with the nourishment that I had hoped, but we are beyond blessed with a healthy beautiful baby girl. I still cry a little every day when I think about all that we have been through, but as soon as I look at Willow, all my pain melts away. There’s a lot of pressure out there to breastfeed; commercials/advertisements stating that breast is best. To all the mamas out there who have shared the same experience, or are going through it now, I’d like to share some words of wisdom that are helping me move on to the next day: Our pediatrician said that there is no scientific proof or differences between breastfed and formula fed babies – but there is a significant difference between the baby who is breastfed by a mother who isn’t fully present and the baby who is formula fed by a fully engaged mother. At every feeding I get to look Willow in the eyes, talk to her, sing to her, and just fully take her in. I may not be able to breastfeed, but I can take pride in my determination and love for this baby girl. Every day I continue to put her to breast before feedings and religiously take my herbs. I haven’t fully given up hope yet, but I’m slowly coming to terms with the hand I have been dealt. Mandy, I am so sorry things didn’t go as planned! I DON’T think you should feel embarrassed at all that things didn’t go as planned. or that it didn’t end up being natural. Beware – people will say dumb things about how you didn’t really give birth, since you had a c-section… it’s happened to me. There wasn’t much you could do, you tried for soooooooo long to do it your way. in the end, both you and willow being healthy is what’s important & this way, you are. i’m sorry breastfeeding isn’t working out. but you just maximize that feeding time and enjoy it – either way, it is a magical time. hog it, i say. i had a friend who nursed for a few months and then would switch to bottles and she always said to me, “oh, i love bottle feeding because i can give the baby to my husband during a feeding.” and i always thought, but that’s my special time. my husband did so much other stuff, but feeding mikey was mine. til he got on solids… anyway, i’m babbling. but don’t be hard on yourself. remember that your hormones are crazy right now and that things are harder to deal with… she’s healthy, you’re a great mama, you’ve got your little family – nothing else matters. just enjoy this time while she’s tiny – they grow up soooooo fast! I had no idea of the struggles you went through, but I can say that I am so proud of you. Happy for your new family. I have not yet experienced childbirth, so I have no experience in this kind of pain. I just can only imagine what you have gone through- and quite frankly – I dread that someday I may go through the same, but your strength and frankness have given me some strength too. I am sending you love and hugs from Chicago and wish I could be there for you. Mandy, first of all congrads on your adorable little girl, she is beautiful and so lucky to have you and Josh as parents! You are brave to share your experiences about Willow and time will heal everything. Willow will be the amazing because of you. I never planned a c-section either. It was not my plan. After being told after my second c-section (encouraged to v-back but chose not to) that I had several spots one cell wall thick on my uterus and that if I had chose to deliver without a c-section that baby and I would both have been in serious danger… I am thankful for what I didn’t know and thankful God knew best. Love you Mandy! Mandy~ You had quite the experience. While I have never had children I can’t really fully understand your loss, but you have a beautiful baby in the end. I have a wonderful friend who had a similar situation, she had to have a c-section and her son spend months in the hospital sick. She always felt a little jipped until she had her second baby. She had Jordan in the car with her first child (age 10 at the time) in the back seat. Her husband was driving and she had the full on experience. I have asked her which was “better” and she has never been able to decide. Nature has a funny way of telling us that we don’t really have much control. I hope time heals the emotional wounds of your planned birth but I know looking at your beautiful daughter must really help. Thanks for sharing.